In the July 2012 Dewan Negara session, I asked the Minister of Agriculture statistics on dairy cattle farmers and why is that Indian cattle farmers don’t receive any assistance from veterinary department. The Ministry of Agriculture replied that they don’t have latest statistics on racial breakdown of cattle farmers but there are a total of 69524 registered with them. However the 2006 statistics shows that there were 34745 Malay, 4188 Indians, 1111 Chinese and 2664 other races in cattle rearing industry. Indian farmers are mostly in dairy cattle rearing. Of the 788 dairy cattle farmers registered 669 (84%) are Indians. He further added that under the agriculture national key economic area (NKEA), 13 entry point projects cluster dairy farming, 156 Indians (74%) out of 212 farmers were selected to cooperate with Anchor Company Allied dairy Sdn Bhd. The 212 selected farmers were given 1450 dairy cattle along with milking and storage equipments were distributed to farmers. Therefore it is not true that Indian cattle farmers do not get any assistance from veterinary department. Technical and extension services are given out by veterinary department to all dairy farmers regardless of race, religion and political divide. These EPP 13 plans were initiated after the GE12 March 2008. Before 2008 no help was given to Indian cattle farmers. Veterinary doctors and officials are not liberal minded and inexperienced and not knowledgeable at all. Farmers are more knowledgeable than veterinary doctors. Indians are very experienced and show a keen interest in dairy farming. But unfortunately the veterinary department does not know how to capitalize on their strength. Ministry of agriculture plans to invest RM32 million each year from 2011 and 2012 to develop commercial dairy clusters and more downstream activities under EPP 13 program of NKEA agriculture. But on the ground we cannot see any major difference in dairy farming. The assistance given now is not game changer but is of help to poor farmers. Since the introduction of EPP 13 program, veterinary department need a thorough revamp if government wants to bring economic transformation. In 2007, self sufficiency rate for milk in Malaysia was a mere 5% (51.07 million liters). Malaysia was importing 95% (1.034 billion liters) of milk from foreign countries such as Australia, New Zealand, Holland and etc. Still, the industry was worth RM 69.25 million locally. If we produce 100% of the local demand, we could generate RM 1.477 billion for the country! On top of that, we will actually save RM 1.4 billion annually. But the Ministry does not have any long term vision to develop dairy farming. There is very little interaction between veterinary department officers and Indian cattle farmers. No new innovative concept of dairy farming introduced to Indian farmers. Many cattle farmers work in estate to rear cows due to lack of land. Some estates owned by GLCs and MNCs allow cattle rearing but there are controls and restrictions that do not encourage cattle rearing. Veterinary department do not facilitate and mediate issues arising from cattle rearing between farmers and estate management. Estate workers face difficulty in keeping cows in estates. EPP 5 plan under NKEA focuses on encouraging the rearing of cattle in oil palm estates. But there is no such effort visible on the ground. It’s all big talk and hype but no proper implementation on the government. Unfortunately people like Datuk Sharizat Abdul Jalil can secure RM250 million for national feedlot project which was never used for cattle rearing. But genuine cattle farmers don’t get even a lease land and support to expand cattle farming from ministry of agriculture. With proper support and guidance Indian dairy cattle farmers will save billions of ringgit and make dairy farming a big revenue earner for Malaysia. The current MP for Labis Datuk Chua Tee Yong who is a deputy minister of agriculture has not done anything for cattle farmers in labis except giving cows to MIC and PPP local leaders who are not cattle farmers. Discriminative policies are the biggest stumbling blocks to farmers. BN government has failed to develop this industry which is dominated by Indians. Cattle farmers should convert their milk into downstream products to add value and sell at better prices. EPP13 plan to develop cluster dairy farm is a failure to far. Cattle farmers need a political change to expand their dairy farming. It’s now or never. Yesterday 20th Sept, Datuk Chua Tee Yong, MP for Labis gave sumptuous lunch and door gifts to appease the angry and disappointed Taman Segar and Taman Tenang residents in labis over their prolonged water woes. Along with the MP for Labis came media and SAJ holding officials about 15 of them to inform residents that they are taking action to pump water up to the higher grounded houses. When the water problem was first highlighted over the media in early Sept, Datuk Chua Tee Yong vehemently denied that there is water problem in these Tamans. He took the media and opened the tab to show that water is flowing as normal and blamed me for creating an issue out of nothing. In fact he advised me to tackle Selangor water problem and don’t create an issue for publicity purpose. I told the residents that after we raised the water problem, it is their own MP who is denying. It is up to the residents to come in full force and send a strong message through the media that their water problem is real. All their previous petitions handed over to MIC; MCA and PPP leaders did not reach SAJ holdings in Johor as was revealed to me during my visit to SAJ holding office in JB on the 10th. The residents gathered on the 18th Sept, and spoke loud and clear about water problem to the media. In fact Datuk Chua sent his MIC, MCA and PPP guys to dissuade the residents from meeting on the 18th evening. Besides, he along with SAJ holdings played tricks by increasing water supply during the period residents met the media in the evening. Water supply stopped once the gathering ended. This angered the residents further. The angry protest and bigger gathering on the 18th Sept woke up Datuk Chua and he responded by organizing one appeasement lunch gathering at 2pm on 20th Sept. he scattered and avoided questions and stayed focused on assuring that water problem will be solved within a month. He was caught red handed when residents asked how is that water flows as normal when Datuk Chua comes. SAJ holding officials were there to protect him. Now he has no choice but to see that water problems of Taman Segar and Taman Tenang is solved. DAtuk Chua and SAJ holdings officials have short down the proposal to built overhead water tank which is in the original development plan. Datuk Chua Tee Yong should work in his constituency to improve water supply not only in Taman Segar and Taman Tenang but in other higher grounds. There are other housing estates in Labis facing similar water supply problem. Datuk Chua should focus on these problems and not raise Talam and Selangor water issues which are ably handled in Selangor. There is no scarcity of water but the construction of pipes and pumping water up is not able to cope with development of newer housing schemes. Majlis dearah Labis which approval the original development order without proper must ensure water supply is restored soonest. Now that SAJ holding is in the know of water problem let’s see how quickly they resolve the poor water supply to affected areas. SAJ holding has become a political tool of BN. Water, water everywhere but none for the residents of Taman Segar and Taman Tenang who are being deprived of daily water supply for the past 12 years. Residents of Taman Segar and Taman Tenang in Tenang, Labis have been suffering poor water supply. No water during days and trickles and drips during late night and early morning hours. During festive periods there is absolutely no water. Residents lament that during any family reunion or gathering they will visit their relatives and children and won’t want the relatives or children to visit them because of no water. They have been complaining to local MIC, MCA, PPP leaders but nothing has changed. Signatures were gathered during the Tenang by elections in January 2011 and submitted to Johor exco member Mr. Asohan and deputy minister in PMO Datuk SK Devamany but no sight of any improvement in water supply. 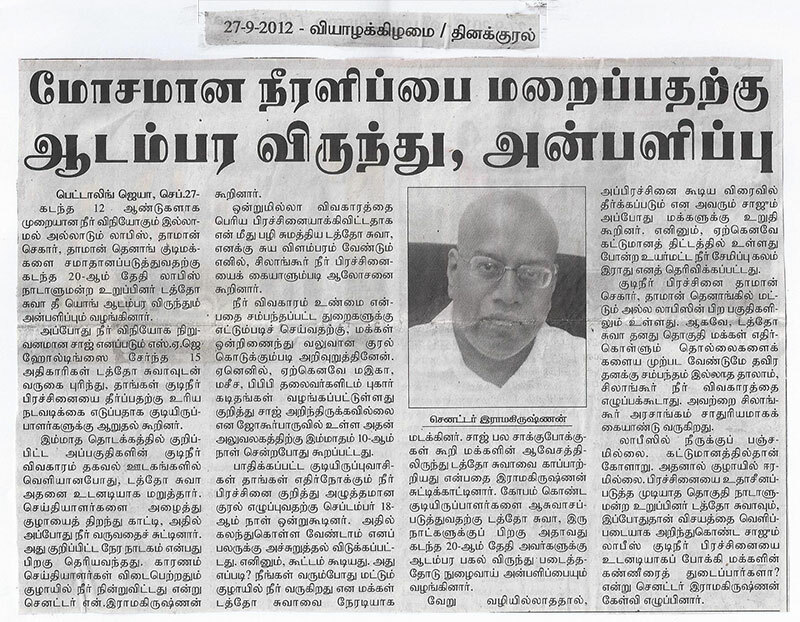 Begining Sept, Tamil daily Makkal Osal and Chinese newspaper Sin Chew reported the water problem. The next day Datuk Chua Tee Yong denied and showed water flowing from tap in the newspapers. On the 13th august I wrote a letter complaining of water supply in Tenang and followed up with personnel visit to SAJ Holding office in JB on 10th Sept. The planning General Manager and his assistant expressed that they have no knowledge of this issue and I requested a meet with Tenang residents on the 18th of Sept. The SAJ planning GM said he will send staffs from Segamat office to meet the people. Later on the 14th Sept I received a text message from the assistant manager saying they will not meet residents on 18th Sept but on another day on their own. Since we already arranged the meeting with residents, we called the media to listen to the residents complains themselves. On 18th Sept when residents met media to complain, water was flowing from the taps. Water was flowing as normal the day Datuk Chua Tee Yong came to show media that nothing wrong with water supply and the day residents were meeting the media on the 18th Sept. Residents are puzzled as to how was that water flowed as normal, when Datuk Chua Tee Yong visited the Housing estate and the 18th Sept. and not on other days. Since water supply was normal on these two occasions, SAJ holding has no excuse for not improving the water supply on all the other days. Water supply stopped as usual on the 18th Sept night after the resident meeting with media. SAJ holding should not become a political tool of BN. SAJ Holding must remember that they cannot sustain themselves if they support irresponsible MPs and don’t serve consumers. Residents have a right to demand for proper water supply and SAJ holding is accountable for this water debacle of residents and not play politics along with BN MPs. How did the Majlis Dearah Labis and water works department cannot approve housing schemes when proper water supply was ascertained? In this case house buyers were cheated and left high and dry. Maljis Dearah Labis cannot wash their hand off claiming it is not their problem but of SAJ holding. It is the majlis who approved this housing scheme. Residents claim that in the original housing development plan there were provisions for overhead water tank. But the overhead water tank did not see the daylight. Labis was a MCA stronghold all these years. This is what MCA leaders have done in return for the voters. Datuk Chua Tee Yong wants to soften the angry resident with providing sumptuous dinner on the 20th Sept in Taman Segar. Residents want proper water supply and not a meal. Well I was told residents are waiting to see him. Since becoming premier in 2009, Datuk Seri Najib Tun Razak has been giving hints that GE13 will be called anytime soon to seek a new mandate from Malaysians. And now that the election commission machinery is ready to hold GE13, the PM is keeping the whole nation in suspense by not calling for the election and so far there is no indication yet when it will be held. Many people are waiting anxiously and even postponing their overseas visits. Businessmen and foreign investors are holding on to their investments and business decisions. This impasse has slowed down the economy and many seem to be adopting the wait and see attitude. Is the PM fair to them? Should an election date be predetermined to prevent uncertainties in Malaysia’s democratic machinery? It is not that the people and the nation are not ready for election but it is UMNO/BN that is feeling unprepared, uneasy and nervous about the election outcome. UMNO/BN has never tasted defeat and never wants to be defeated even if the people decide to leave them out. If given a choice, BN would never want to hold election any time soon. They want an uninterrupted rule as the longest elected party in the world. PM and his deputy are blaming PAS, PKR and DAP except themselves for their current election dilemma. UMNO leaders have resorted to instilling fear among Malays that if UMNO loses, the Malays will lose it all. UMNO must do plenty of soul searching within to find out why are the Malays deserting them. The Malays are more aware and have realized the economic realities of the changing world around them. They have outgrown UMNO’s narrow political clutches. Malays don’t want to be talked down as though UMNO knows all. They have begun to see through the corruption, cronyism and hypocrisy of UMNO. UMNO has never stopped using the race and religion card to divide Malaysians despite 55 years of independence. PM and UMNO/BN are putting forth all kinds of insinuations and accusations about PR, with the hope of denting their political prospects. But PR seems to be holding on and becoming a formidable opponent of UMNO/BN. Each racial slur and every stone thrown at the PKR tour bus will chip away support from UMNO/BN. What worked in the past is working against UMNO/BN now. But UMNO leaders seem to be oblivious of these political realities. UMNO/BN uses threat of fear and violence on non Malays should UMNO/BN loses. PM/DPM instigate racial hatred and suspicion among UMNO supporters against non Malays and at the same time talk about 1Malaysia and national unity to non Malays. UMNO leaders have developed and sharpened their skill of talking in fork tongue when in company of different communities. These micro managing of the divide and rule policy of UMNO has never allowed Malaysians to be united and this very same policy of UMNO has come back to hound them now. Malaysians seem to have outgrown the UMNO/BN rhetoric and poised for a change. What happens to the nation doesn’t bother UMNO/BN leaders. To PM and DPM the survival and sovereignty of UMNO/BN is far more important that the national economy and welfare. They are holding the whole nation at ransom. Looks like as long as they don’t see the hope of winning GE13 for UMNO/BN, Datuk seri Najib Tun Razak won’t call for election. Will election ever be called? Recently former PM Tun Dr Mahathir said that once PR takes over the government, it will rule forever. Dr Mahathir, the most influential UMNO leader knows that with so much abuse and corruption, UMNO may not be redeemable in the future. Therefore, calling for GE13 and winning big may be a gargantuan task by any UMNO leader today. How will Datuk Najib decide to call for election under such predicament? Difficult choice indeed! Bring back the multi racial national schools of the yester years. Education Minister Tan Sri Muhyiddin Yassin unveiled the country’s new education blueprint aimed at revamping the education system into one that is supposed to produce global players. While the attempt to revamp is a welcomed one but the movers who are supposed to shift the current system and implement the new dynamic education system seem to be the same people whose actions and inactions deteriorated the current system. Will the hardliners both at the political and bureaucracy level allow the smooth liberalization and transformation of the new system? Will Perkasa and the like allow the decentralization of school authorities, depolarization in schools and liberalization in religious education in the current system? All the previous attempts like the implementation of smart schools and the teaching of maths and science in English have been waste of billions of ringgit. Malaysia never lacked good laws, policies and plans but the implementation is where the flip flop, changing of goal post and the half hearted execution leading to the current quagmire in the education system. In 2006, a national education blueprint 2006-2010 was released by the then prime minister Tun Abdullah Badawi to bring about revolution in education. The Blueprint goals was to establishing a National Pre-School Curriculum, setting up 100 new classes for students with special needs, increasing the percentage of single-session schools to 90% for primary schools and 70% for secondary schools, and decreasing class sizes in primary schools and in secondary schools by the year 2010. Are they achieved? Did the 2006 blueprint address the problem of racial polarization in schools as envisaged? Taking into consideration the religious fervor in the education system, can the system be ever reformed by the same staff who allowed the religiosity to take root? Now the 2012 national education blueprint was released by Datuk Najib Tun Razak to make 11 strategic and operational shifts to transform the country’s education system. Will it face the same predicament as the earlier ones? Unless the ministry of education makes a structural overhaul, recruiting multi racial talents with wide experience from different backgrounds, transformation may not be possible. One generation of good and effective headmasters were replaced with mediocre performers. The same mediocre headmasters and ministry officials are given the responsibility to bring about transformation in schools. The comments from teachers indicate that they don’t have confidence in their heads to give fair assessment. For transformation to take place all selection and decision making bodies in education ministry be made multi racial and multi lingual in view of the fact that we have Bahasa Malaysia, Chinese, Tamil and agama schools. The imbibing of critical thinking and analytical discourse must start from teachers themselves.